Kospel electric Boiler Heating baths Central heating Electric heating EKCO. The description of this item has been automatically translated. 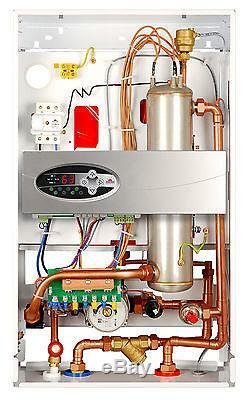 Kospel electric boiler Heiztherme Central heating Electric heating EKCO. Electric boilers with A USD ehnungsgefäß as electric central heating for radiator radiators or floor. 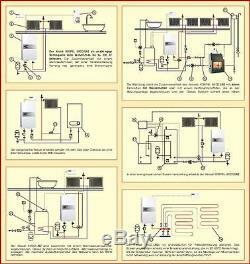 The electrical Heiztherme EKCO is designed for central heating. It ensures maximum comfort and precise Temperatureinstellmöglichkeiten in all rooms. The electronic control ensures easy availability and economic operation of the instrument. For the electric boiler you need no chimney! The Heiztherme you can space-saving installation in the home, in the House, detached houses, conservatories and in objects without existing or installable chimney. The electric central heating can be combined as a supplement with other heating systems such as solar panels, wood-burning stove, solid fuel boilers, heat pumps or heat recovery systems. We recommend operating the electric Heiztherme with a. To operate thermostat to the function of the boiler be able to adapt your individual needs. With a control optimally adjusted energy savings of up to 30% are possible. The electrical Heitz thermal spa are available in 2 versions: -for radiator central heating EKCO LN2 - Floor central heating EKCO LN2p A combination with a hot water tank is possible. For this purpose, a three-way valve with actuator and sensor temperature is necessary. Technical data in short OVERVIEW. Rated voltage 400 V 3N. Required cable cross-section in mm². 3 x 2.5 (230 V) 5 x 1.0 (400 V). 3 x 4 (230 V) 5 x 1.0 (400 V). 3 x 6 (230 V) 5 x 1.5 (400 V). Maximum temperature in ° C. The electrical output of the boiler is to be adjusted according to the created heat balance of the building. The energy consumption depends on many different factors. Reliable technology of copper pipe heating system - reliable protection against air bubbles. Automatic power adjustment (6 levels). Microprocessor-controlled output of the boiler. Electronic control of the water temperature in the heating system 20 ° C to 85 ° C. A USD ehnungsgefäß 6 liters. Stutz distance about 18 cm away from the wall about 8 cm. Dimensions: 418 x 175 x 710 (width x depth x height in mm). 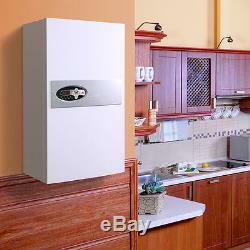 It is recommended to equip the boiler with a thermostat to adjust the function of the boiler to the individual needs. The correct setting of the boiler contributes to energy savings up to 30%. Modern technology, economy and comfort! Components of the highest quality. Heater made of stainless steel. Easy to use - fully automatic operation. 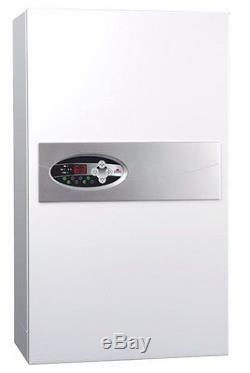 Large heating comfort and high efficiency (99,4 %). Low investment and Maintenance costs. Safe operation due to water flow control system, safety valve and temperature. Ecological - no fumes, smells and sounds. Auraton 2005 RX/TX - room thermostat Funkferngesteuert. Three-way valve with an auxiliary motor and temperature sensor for simultaneous connection of a hot water tank. Customer service is available throughout the territory of Germany and Austria guaranteed. The item "Kospel electric Boiler Heating baths Central heating Electric heating EKCO" is in sale since Saturday, October 21, 2017. This item is in the category "Home, Furniture & DIY\Heating, Cooling & Air\Other Heating, Cooling & Air". The seller is "guterbobby" and is located in Brand-Erbisdorf. This item can be shipped to all countries in Europe.